Receiving a diagnosis of hearing loss requires a shift in lifestyle and sometimes of self-identity. Facing hearing loss and sharing the journey of change and new experiences with others is a truly courageous thing. Sarah Wegley also known as the blogger the Speak Up Librarian is just such a courageous person. 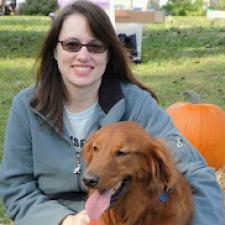 Sarah Wegley learned that she had hearing loss at forty years old. At first, she felt very alone, but quickly became part of the online deaf and hard of hearing community. Being a librarian, Sarah had a keen thirst for knowledge and so started on a path that would give her the information she needed and in the process inform and befriend others on the same journey. People Hearing Better is proud to be able to share guest blogger Sarah Wegley’s hearing loss story with you today. Over the summer of 2006 my family and I gradually became aware that I couldn’t hear a few sounds that they had no problem hearing. Unless I stood right next to them, I couldn't hear the basement telephone ring or the chime from the kitchen's coffee maker. All spring and summer I had been battling sore throats and recurring infections, so I assumed I'd hear those sounds as soon as I felt better. On September 19 I sat at the library reference desk when someone opened an emergency exit door, triggering a steady high-pitched alarm. The key for turning the alarm off is at the reference desk, so it was my job to turn it off. But I didn't hear it! I heard only a distant throbbing. I thought it construction from another part of the university and ignored it. When the alarm continued for several minutes, a perplexed reference desk supervisor came to assist. I walked with her toward the emergency exit door and began to hear the alarm. Still, it wasn't uncomfortably loud as it had been in the past times. Something wasn't right. I assumed the doctor would say that all would be well with the right medication. As soon as my desk shift was over, I called an otolaryngologist. I explained what had happened and they gave me an appointment for the very next day. At that point, I assumed the doctor would say that all would be well with the right medication. The doctor examined my ears, nose, and throat and then an audiologist tested my hearing several different ways—including a tuning fork and a soundproof booth. In the booth, I had to say out loud what had been said. Yikes - there were several possibilities in my mind - which one had been said? The worst part of the testing came when I had to push a button as soon as I heard a tone. At first, I heard the tones easily but they grew increasingly hard to distinguish...had there been a new tone or only an echo floating in the air? Should I push the button or not? Then the booth became completely quiet. The test wasn't over. My heart sank. I was completely shocked! At my age how could this be possible? The audiologist kindly explained that I had permanent hearing loss. My colds and allergies and stuffed up nose did not account for my being unable to hear the alarm. I was a candidate for hearing aids. I was completely shocked! At my age how could this be possible? I wanted to hear, so I didn’t require time to think about hearing aids as she suggested. I placed my order that day. As soon as I had my hearing aids, I was amazed at how much louder speech sounded. After a few weeks, my hearing aids arrived. The audiologist fit me with two behind the ear (BTE) hearing aids. Surprisingly, they were easy to put in and felt very comfortable. As soon as I had my hearing aids, I was amazed at how much louder speech sounded. Both my voice and the audiologist's were easier to hear. As I walked down the office hallway to see the otolaryngologist, I couldn't believe how loud my flip-flop sandals sounded. Could everyone else hear how loud my shoes were? As I drove home, I discovered that cars make a swooshing noise as they passed. When I left the office, I was startled by the loudness of the outside world. As I drove home, I discovered that cars make a swooshing noise as they passed. Have they always done this? When I arrived home, I walked my neighborhood and enjoyed the awakening of my senses. I remembered when I was a child and received my first pair of eyeglasses. Suddenly I'd found that it was possible to see individual leaves on trees where there had only been a blur. My walk that day felt much like that experience. Thank you Sarah for sharing your inspiring story with us, and for all of your openness, research and the information you provide on your award winning blog, Speak Up Librarian. If you'd like to learn more about Sarah and her experiences learning to cope with her hearing loss, visit her at her award winning blog!